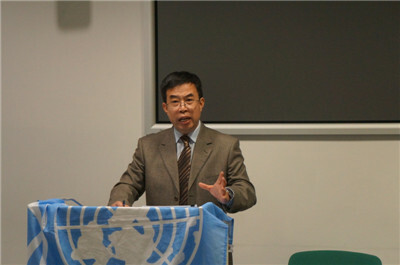 On November 26, Minister Counsellor Yang Xiaokun of the Chinese Embassy was invited to deliver a speech on multilateral diplomacy at the University of Cambridge. This event was organized by Cambridge University United Nations Association (CUUNA) and attended by more than 60 teachers and students of the University. Speaking from many years of experience, Yang shared his views on the importance and necessity of multilateral diplomacy, covering the past, present, and future of multilateralism, the common challenges facing the world today, the trade friction and protectionism and the challenges to multilateralism itself. Focusing on the three pillars of the United Nations, namely Peace and Security, Development, and Human Rights, Yang expounded China’s engagement in UN peacekeeping operations, South-South Cooperation, tackling the climate change, the 2030 Agenda for Sustainable Development and resolving global hotspot issues. He provided detailed data and cases to illustrate China’s role as a staunch defender of international order and multilateralism. Yang also stressed that over the past 40 years, China has made tremendous achievements in the fields of economic and social development, global cooperation and human rights through reform and opening up, and created the "China miracle”. China will continue to uphold multilateralism, safeguard the international order and system centered on the purposes and principles of the UN Charter, and work closely with other countries to build a new type of international relations and a community with a shared future for mankind. 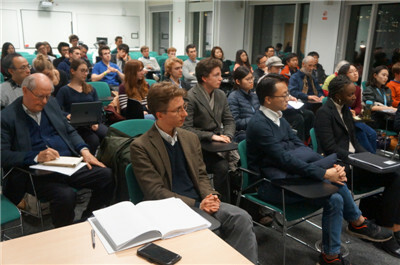 The event was attended by teachers and students of the Cambridge University. After the speech, Yang answered questions on the Belt and Road Initiative and the UN, and issues of human rights, South China Sea, the military strength of China and trade protectionism.